The management of Hol Chan Marine Reserve is reporting that a Black Tiger Prawn originally from Africa, Australia and Southeast Asia was fished outside of the Hol Chan Marine Reserve off Ambergris Caye. 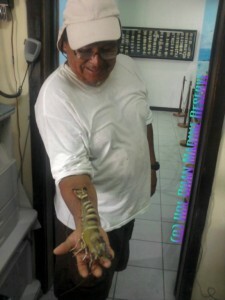 This is the second prawn that has been found in Belizean waters since May. The first was fished off Toledo’s coast sometime in May. The species of shrimp is considered to be invasive and there is concern about the effects it can have on the environment and shrimp farms in Belize. Speaking to The San Pedro Sun Miguel Alamilla, Marine Biologist and Manager of Hol Chan Marine Reserve shared his concerns relating to the prawn now being found in Belizean waters. “This species is huge in aquaculture, and in 1988, it was released from a research facility in North Carolina and it has been coming downstream since. In 1990 it was reported in South Florida, then the Caribbean and now Belize. It is an invasive species because it is not endemic to this region. Any rare species found in our water is cause for concern. We don’t really know the level of ecological impacts of the prawn to the marine environment. From previous studies and reports, we know that this species is a very aggressive feeder and it preys on many small shrimp and other species that live in our seas. It is also a carrier for 16 different known viruses that can negatively impact native shrimp and even wipe them out. So it is enough reason to be concerned,” outlined Alamilla. According to Hol Chan Marine Reserve, there was a similar finding in the Toledo District and reports from the Fishery Officer are that a prawn was seen for sale at the fish market in Punta Gorda Town. On average, a prawn can grow up to 14 inches in length and can weigh up to 11 ounces. “This particular prawn found off Ambergris Caye was 12 inches long and weighed 8.5 ounces. It was found just south of Shark Ray Ally in the Hol Chan Marine Reserve outside the reef. It is usually a coastal marine species that lives in closed environments or where rivers flow into the water. This one was found on the surface just outside the reef,” explained Alamilla. The prawn was found by local fisherman Severo Guerrero Sr. as he was heading outside the reef on a fishing expedition on June 6th. “I do believe they are in our waters. We have had two confirmed sightings already, which is very much indicative that they are here. How many and what is the extent of the population; we don’t really know. What we definitely know is that they are in Belizean waters now. The good part is that they have natural predators. Like any normal shrimp species that inhabits our coral reef, there are many predators that can feed on prawn. However, they have a very healthy reproductive system,” said Alamilla. Prawns can be consumed, much like local shrimp, so Hol Chan Marine Reserve officials are encouraging tour guides and fishermen to catch them. “If they spot or catch them, we want the local guides and fishermen to report it. We need to begin gathering information as to where they are seen. They are tasty and good to eat so we also want the locals to catch and eat them,” explained Alamilla. The sighting is being reported to the Fisheries Department and other relevant agencies. 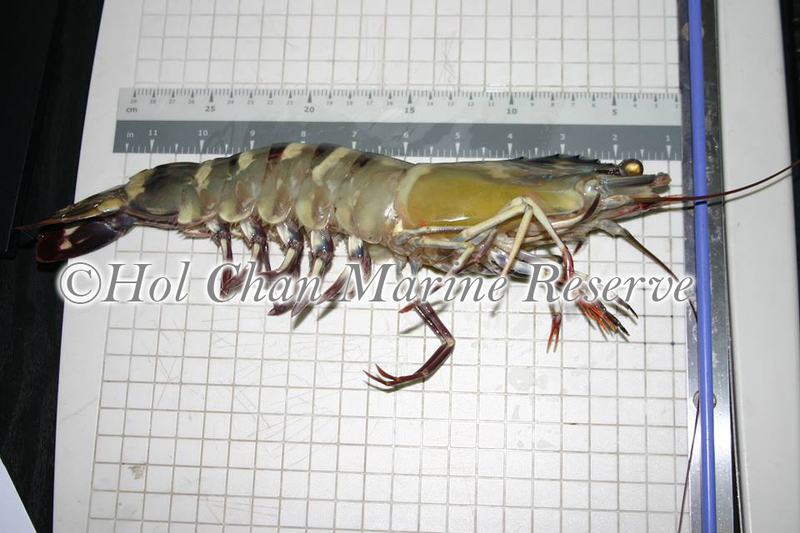 If you spot any prawn in Belize’s coastal waters you are asked to contact Hol Chan Marine at 226-2247.